If you follow any financial independence blogs or podcasts … a resounding theme is to save a lot more than you spend. Some bloggers call it “growing the gap” … which basically means increasing your income while lowering your expenses. Everything leftover would be considered savings. In order to reach financial independence one day in the future … those savings need to be invested in order to compound and grow your income even further. For example, my wife and I are investing a good portion of our savings into building a dividend income portfolio. One day in the future, we plan to use the dividend income generated from this portfolio to cover about 50% of our current expenses … which is around $30,000 a year. Some people choose to invest in rental real estate in order to generate passive income. Others focus building an investment portfolio of low fee index funds while others invest in building businesses that help to widen their savings gap. Those are some great tools for building wealth and growing the gap. But before you can leverage any of those tools, you’ll need to focus hard on increasing your savings rate … while still living a life that matters to you. 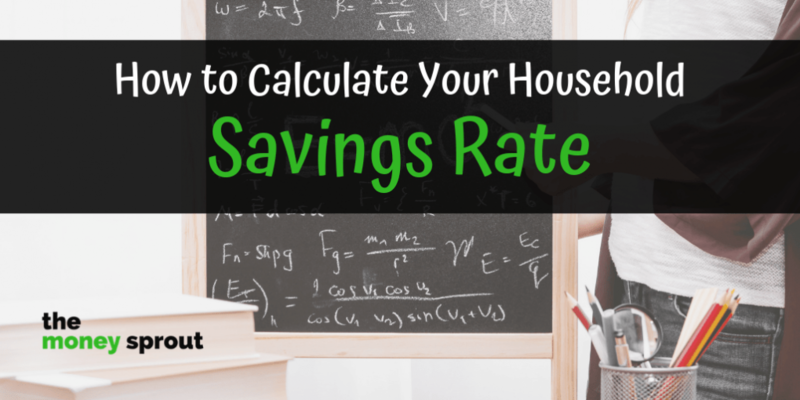 Let’s take a look at how you can calculate your household savings rate. This information can help you set goals to improve your savings over months and years. And eventually you’ll be able to use those savings to leverage tools like dividend stock investing to compound your wealth. 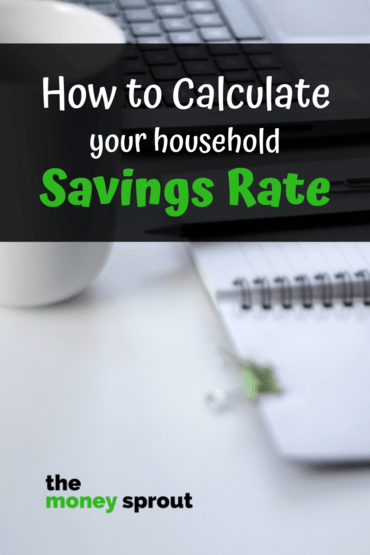 There is often a lot of confusion around calculating your household savings rate. What do you consider savings? Investments sure but what about payments made on loan principal that ultimately increases your net worth? Then there is the income side of the equation. Do you calculate your income before or after taxes? What about payroll deductions? Do you add in your investment and side hustle income? There is no right or wrong way to calculate your savings rate, and opinions will vary on the correct way. So today, I would like to share my approach to calculating our household savings rate. I have broken it down into 6 simple steps that we use and provided examples of our household savings rate calculation for the past month. Keep in mind, what works for our family may not work for you. What do you consider part of your monthly savings? Some types of savings are obvious like – retirement account contributions to a 401K or IRA, stock purchases in a taxable account, or investments into a savings account or certificate of deposit (CD). Note – As you can see from the numbers above, the majority of our investments last month were made to work place retirement accounts through my employer. I don’t get any company match on my 457(b), but I do get some employer contributions into my pension. Since the employer pension contribution is not fully vested yet, I am not going to include it in our household savings rate. However, if I were to have gotten an employer match into a 401K or other equivalent … I would have included it. Next, let’s explore another potential bucket of savings you may want to include in your calculation. Other savings that you could possibly include is a little more of a gray area. Personally, I am going to take the approach of including anything that increases our net worth towards our household savings rate. So the principal on our mortgage will be included. You could also include the principal on student loans, cars, etc. I would not include payments made to credit cards however. The majority of our van loan payment listed above is principal at this point. We have a 1.56% interest rate on the loan. Our interest payment last month on the vehicle was $4.56. In addition, we are trying to pay off this debt (van payment) early, so we added another $85 extra payment on the principal … which will be included in our savings. Our other car loan is at a 0% interest rate … so the entire payment went towards paying down the principal. Finally, the principal portion of our mortgage last month was $446.53 which will be considered savings too. And we paid an extra $21.79 towards the principal … which we do every month. Basically, we just round all of our monthly mortgage payments up to the nearest $100. Note – When calculating your household savings rate, you will need to decide what you will include. Just be sure to make it consistent every time you track your savings rate. Our overall savings last month totaled $3,317.95. This amount includes all investments as well as any principal payments we made on our liabilities. Again, it’s up to you what you consider savings. You may want to include the principal amounts you are paying towards your debt. Just make sure to stay consistent month to month or year to year when you do calculate your savings rate. The next step is to calculate our total income from the same time period. If you thought that calculating your total savings can vary depending on your situation … defining your income can be even more challenging. For example, you could use your gross compensation (before taxes) or you could use your after tax compensation to name a few options. Personally, I prefer to use my after tax compensation when calculating our household savings rate. Since we are really only receiving W2 income at this point, our income calculation is simple. I just add up our take home pay for the month and use that in our household savings rate calculation. Note – We are starting to earn a bit of side income from our blogs but not much at this point. Once we get to a certain threshold of income I plan to start including it. In addition, we also earn over $3,000 per year in dividend income. We don’t plan to include this income because 100% of it is currently reinvested or “saved”. Our total W2 income last month after taxes and payroll deductions came out to be $4,907.84. Now that we have our two pieces of data (savings and income), it is time to calculate our household savings rate for the month. The household savings rate calculation is very simple … that is once you define your savings and income. In order to calculate your percentage, you take your total savings and divide it by your total income. The result is a percentage … which indicates how much you are saving. In our example from last month, we took our savings ($3,317.95) and divided it by our income ($4,907.84) … which looks like $3,317.95 / $4,907.84. Our household savings rate last month calculated out to be 67.6%. What does this actually mean? Well … approximately 67% of our take home income was used last month to increase our net worth. A portion of that savings went towards investments like our 457(b) plan and Roth IRA account. A smaller portion of that savings went to pay down the principal on some of our debt. The other remaining 33% of of our income (what didn’t go to savings) went to pay for things like – food, clothing, interest on our mortgage, utility bills, healthcare expenses, etc. Overall, I think this is a very healthy savings rate and one we plan to continue tracking every month. Which brings us to our last step – staying consistent in our household savings rate calculation. If I took your savings rate and tried to compare it against ours … it wouldn’t tell me all that much to be honest. That’s because I bet you used a slight variation in your calculation than I did. And that’s okay. Comparing your household savings rate against others really serves no purpose. But comparing your household savings rate this month to the following month does have purpose. It gives you an idea of how well you are saving the income you are earning. The comparison can give you the information you need to make changes in your spending or maybe it gives you the motivation to increase your income? Remember the goal is to widen that gap … and it all starts with a high savings rate. This is why you need to stay consistent when you run your comparisons every month or year, depending on how often you calculate your savings rate. So if you use your after-tax income this month, plan to use it again next month … so that you are comparing apples to apples. This isn’t to say you can never change the inputs of your calculation … just make sure to be consistent going forward if you decide to. Why is Your Savings Rate Important? I probably don’t have to tell you by now the importance of your savings rate. Having a high savings rate is a powerful life hack that will give you power over your life. It will give you options and let you decide how to live your life. I feel so strongly about having a high savings rate that it is one of the top lessons I want to teach my 3 children as they get older. My wife and I have always been good but not great savers. We definitely live below our means but have made some questionable financial decisions like buying a house that was too big. Looking back over the past 20 years … if we would have adopted a 50% savings rate, we would have already reached financial independence several years ago. Instead we are still in good shape … but are many years away from that same number. Do your future self a favor and start calculating your savings rate. It doesn’t take that much time or effort and could change your life if you let it. How often do you calculate your savings rate? What types of savings do you include? What about income? It will be interesting to hear different opinions on how savings rates are calculated. How Much Does It Really Cost to Own a Home in 2018?